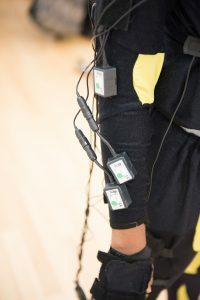 Research questions for the project focus on how technologies developed or refined through the video game industry including motion capture, augmented reality, and 3D display can be used to provide useful methods of studying choreography and dance composition. In particular, the project asks the following questions. First, can technologies developed or refined through the video game industry be used to visualize qualitative aspects of dance rather than purely quantitative aspects? Second, do students of choreography have a more embodied response to dances visualized through a video game engine than they do when reading a Labanotation score or watching a video? Finally, does an animated, 3D score of a dance provide more useful information for understanding a choreographer’s intent than a traditional Labanotation score? 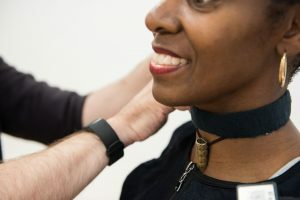 In this rehearsal clip (11 September 2015), Sheron Wray demonstrates and analyses for Jean Johnson Jones and Kirk Woolford one of the major movement motifs of the dance, Harmonica Walks. The project utilizes two research methods or approaches, Labananalysis (Labanotation and Laban Movement Analysis) and digital technologies including motion capture, augmented reality, and 3D display to achieve its aims. Although each of these methods can effectively be applied to the recording of movement, each is also found wanting in different ways. Labananalysis, for example, takes account not only of the movement of body parts, but also considers the dynamic or qualitative aspects of movement (Effort). This component of movement is not only significant in dance, but other movement forms such as sports and business management. This aspect of movement is absent from motion capture technologies. Labananalysis, on the other hand, is, by current standards, time consuming and has yet to be effectively integrated into 21st century digital technologies. In this rehearsal clip (7 January 2016), Sheron Wray examines the influence of Martha Graham vocabulary on the dance. Wray demonstrates and analyses for student dancer Claudia Tonietto what she calls ‘Graham hands’ and ‘Graham contraction’.